COLORADO SPRINGS, Colo. – The College Swimming and Diving Coaches Association of America (CSCAA) has selected a record 713 teams from 460 institutions to the Scholar All-America Team for the Fall 2018 semester. 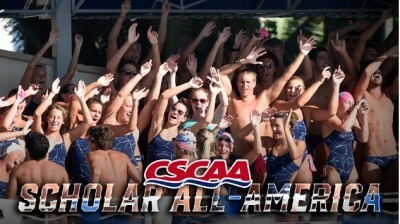 Both the Nova Southeastern University men’s and women’s swimming teams found their names on the distinguished list. The women’s team finished the fall with a 3.50 grade point average, while the men’s team finished with a 3.25. To earn the honor, teams were required to post a GPA of 3.0 or higher for the Fall Semester and maintain a roster of 12 or more student-athletes. The teams were selected by the CSCAA’s Scholar All-America committee on the basis of their Fall grade point averages and represent 16,502 student-athletes. Another CSCAA Scholar All-America team will be announced at the conclusion of the spring semester, where individual student-athletes will also be recognized. To view a full list of the schools recognized, CLICK HERE.